Epigenetic mutation helps explain why, in rare cases, flu can kill. A small number of children who catch the influenza virus fall so ill they end up in the hospital, perhaps needing ventilators to breathe, even while their family and friends recover easily. New research by Rockefeller University scientists helps explain why, a rare genetic mutation. The study is published in Science. The researchers scrutinized blood and tissue samples from a young girl who, at the age of two-and-a-half, developed acute respiratory distress syndrome after catching the flu, and ended up fighting for her life in the hospital which she survived. Years after the patient’s ordeal the team discovered that it could be explained by a rare mutation she carries that prevented the little girl from producing a protein, interferon, that helps fight off the virus. This is the first example of a common, isolated and life-threatening infection of childhood that is shown to be also a genetic disease state the team. The good news from these results, however, is that clinicians have a new treatment option for children who mysteriously develop severe cases of the flu. This finding suggests that one could treat severe flu of childhood with interferon, which is commercially available. The fact that the patient’s genes could affect the severity of the illness wasn’t a surprise to the members of the lab, who have been studying this phenomenon for decades. For instance, they have discovered genetic differences that help explain why the herpes simplex virus, which causes innocuous cold sores in most people, can, in rare cases, lead to potentially fatal infections that spread to the brain. Turning their attention to influenza the team sequenced all genes in the genomes of the young girl who survived her dangerous bout of the flu and her parents, looking for mutations that might explain her vulnerability. Knowing how rare the patient’s reaction to the flu was, they narrowed their search to mutations that were unique to the little girl, then focused only on those that affected the immune system. What emerged in the current study was the finding that the girl had inherited two differently mutated copies of the gene IRF7, which encodes a protein that amplifies the production of interferon, a critical part of the body’s response to viral infections. No other mutations could have explained the patient’s reaction to the influenza virus state the team. Each mutation is very uncommon and thus the likelihood of carrying two damaged copies of the gene is extremely rare. Indeed, when they infected a sample of her blood cells that normally produce interferon, plasmacytoid dendritic cells, the researchers measured no interferon. In contrast, blood cells from the patient’s parents, who each carried only one mutated version of the gene, produced healthy amounts of interferon when exposed to influenza. That really was definitive proof that a single, non-mutated copy of this gene is enough to allow people to mount a response to the virus state the researchers. The researchers also employed a cutting-edge technology developed by their collaborators at Columbia University to reprogram the child’s skin cells into early progenitor cells, then differentiate those into lung cells, the front lines of influenza infections. Not surprisingly, the virus replicated more in the patient’s cells than in the same cells from healthy people. Although the patient remains susceptible to severe reactions to new influenza viruses, annual vaccination against seasonal flu has, so far, prevented the occurrence of severe symptoms, indicating that IRF7 is not needed for adaptive immunity to secondary infection by a flu virus. The team state that the patient hasn’t fallen nearly as ill from other viruses, suggesting the lack of IRF7-dependent interferon production may not leave them vulnerable to viruses overall, a situation the researchers say they have also noted with other mutations that underlie infectious disease. 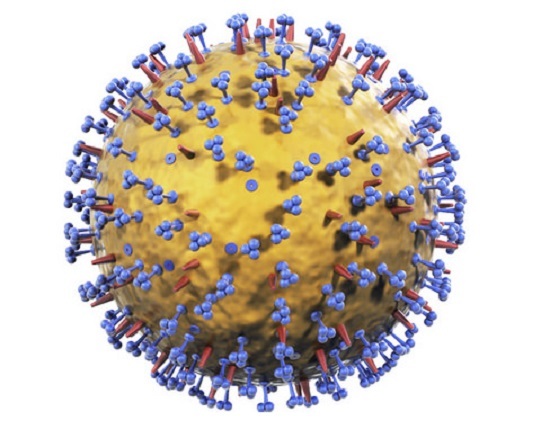 Highly detailed influenza virus model. © Copyright 2014 Creative Crash.